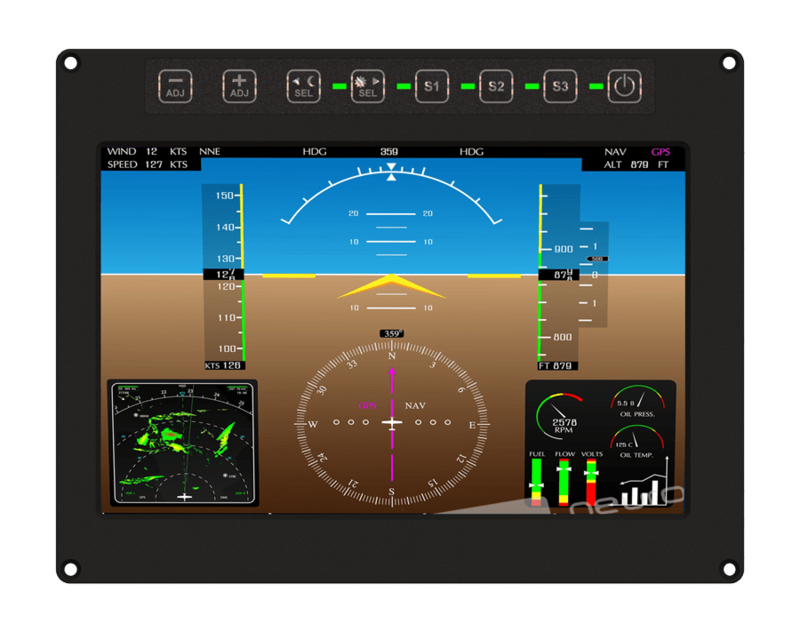 Offering a lower cost alternative to a full-mil certified MFD unit the PM-10.1W features an industrial grade LCD panel with 1920x1200 pixel resolution. A Dual-Mode Hi-Brite/NVIS LED backlight system provides continuous luminance adjustment over two ranges: standard lighting for daytime viewing ranging from 10cd/m2 up to 1200cd/m2 and MIL-STD-3009 NVIS white lighting for night viewing ranging from zero to 5cd/m2. An optically bonded front filter with AR and oleophobic coatings provides impact protection for the LCD panel and enhanced optical contrast for optimal viewing in glaring cockpit conditions. The advanced LCD controller supports up to 2x DVI/HDMI, 2x VGA, 2x 3G-SDI, 1x Composite and 1x Display Port video modes with optional PIP and Video Rotation. The 28VDC power supply operates from 18-36V and features MIL-STD-1275 and -704 spike and surge protection. The PM-10.1W is offered in two configurations to support either commercial or MS-38999 circular I/O connectors to satisfy the environmental requirements. Cooling is by conduction and convection. The PM-10.1W is designed for standard panel mount installation using four bezel through holes but an adapter is available for VESA mounting.